also for my swap partner, my first attempt from the book omiyage by kumiko sudo. well, strictly speaking this is my second attempt as i had to scrap the first one. it was very badly sewn (way too baggy) and the colour choices just didn’t work at all once it was made up. 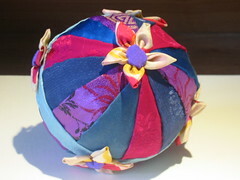 traditional temari are balls of scrap fabric tightly wrapped with threads forming intricate patterns. they’re traditionally made for children by their mothers and grandmothers (more info). this fabric interpretation starts with a thread wrapped ball of fabric scraps, i then added a thick layer of lemon verbena from the garden which i dried in the oven. i was sceptical that it would keep it’s scent once dried but it did brilliantly (i have some left, must see if it makes a good tea). then i wrapped layers of wool over the leaves (the author suggests batting but i used the spinning fibre i had to hand). it’s then all hand sewn. the fabrics are a selection of kimono scraps i got a while ago. most are silk but there was the odd synthetic too. the sewing itself wasn’t overly tricky once i’d realised how tightly you had to tension the pieces around the ball. one edge of each piece is turned over then blindstitched onto the piece underneath, all in situ. 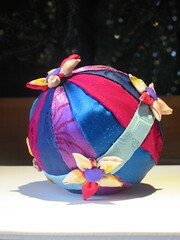 the flowers were pretty fiddly (the ball itself is about 4” across). i had various crises of faith with this, mostly around colour choice, but now i’ve got a bit of distance i’m pretty pleased with it. i still can’t believe i had the patience to finish it, it’s not my usual forte.